Even if you have never read Tess of the d’Urbervilles before, (which I had) upon taking this novel down from the shelf – you just know it’s going to be emotional. I first started reading Hardy when I was about eighteen, and devoured each of the novels and many of the short stories over the next two or three years. I can’t remember exactly when I read “Tess” but for a long time it remained the one I thought I liked the least. It was also the one; I thought at one time, I would be loath to re-read. Embarking upon the Hardy reading challenge a couple of years ago I realised that not only would I have to face “Tess” again, but that I was actually rather looking forward to it. I have found once or twice before, that re-reading novels I first read in my late teens or early twenties and been underwhelmed by to be enormously rewarding. When I was younger I think I needed a happy ending from my reading – and so the tragedy of “Tess” rather traumatised me. I’m not going to embark on a lengthy re-hashing of the story of “Tess” – most people must know the bare outline at least. Set in Hardy’s beloved Wessex – it tells the story of an innocent country girl who is corrupted and brought down by the debauchery of the aristocratic Alec d’Urberville and the hypocrisy of a society that treats men and women so differently. One of the many tragedies of this story is that if Tess’s family had not sought to better their prospects by claiming kin to the ancient d’Urberville family – which they had been told they were descended from – none of Tess’s sufferings would ever have occurred. One of the abiding images for me from the opening chapters of this wonderful novel is of Tess dancing in the fields near her home with the other young girls, in the May-day dance. Dressed in white, and taking part in an ancient tradition Tess appears as the epitome of a young, innocent traditional country girl. As Angel Clare, Tess’s future great love, passes by the dancing girls after briefly joining in the dance – although not dancing with Tess – the reader who knows what is to come, wants to call him back. Tess leaves her family home and meets with disaster in the form of Alec d’Urberville, who vilely preys upon Tess’s beauty and innocence leaving her pregnant and disgraced. Tess feels herself to be guilty and this supposed guilt is in many ways her undoing. A couple of years later and Tess has tried to put the past behind her, going to work at Talbothays dairies as a dairymaid where – briefly she is content. Talbothays dairies are a haven of traditional industry and friendship. It is here that Tess meets Angel Clare – who though he doesn’t know her, she remembers well from the time of the May-day dance. Believing herself to be not good enough for Angel, the son of a clergyman, training to be a gentleman farmer, Tess fights her feelings for Angel. Angel is persistent and naturally the two fall in love. The happiness of the couple is doomed by the shadow of Alec d’Urberville – and the horrific hypocrisy of the times which allow for a man to have a past, but not a woman. Angel is not without sin himself – surely his name is another of Hardy’s wonderful ironies. Angel is not a bad man, but it his stubborn blind pride that is Tess’s final undoing. 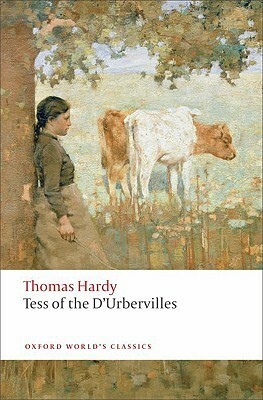 In Tess of the d’Urberville’s Hardy explores many of those themes which are familiar to readers of his novels, society, the disparity between men and women, marriage and the traditions of a way of life that was already on the wane. Hardy’s descriptions of the Wessex landscapes and its rural traditions are, as ever, glorious, his characters unforgettable. Reading Tess of the d’Urbervilles is as I said emotional – enchantment, sadness, anger and a few tears – I experienced them all more than a few times. I am so glad I reacquainted myself with ‘Tess.’ My favourite Hardy’s I think will always be Under the Greenwood tree, Far from the Madding Crowd and The Trumpet Major – but I no longer wince when I think of ‘Tess’ – it might be a tragedy – but it is utterly beautiful and a wonderfully compelling read – happy endings? Pah! Who needs ‘em? I think it’s the desperate sadness and the unfairness to women that has always put me off reading Hardy – I remember seeing an adaptation of The Mayor of Casterbridge and being furious that he could sell his wife. But it does sound very beautfully written. it is 🙂 Hardy’s treatment of women in his fiction is fascinating – it must reflect what he saw around him. I loved Tess from the start, but I always had a weakness for rural melodrama. your Hardy reading has definitely inspired me to read him again, once I’m done with my 20th century project. Oh I am glad you will be re-reading him. I read Tess for the first time a few years ago. I had no idea about the ending, and I was stunned, shocked and dismayed at Tess’ fate. I had no idea and no preparation. I knew there was no happy ending, but I never anticipated the ending that Hardy wrote. Gobsmacked. There’s a reason some books are classics. The ending totally floored me when I first read it. I’m another fan of Tess. I’ve not read much else by Hardy, something I’d like to set about correcting next year I think, but it made a huge impression on me when I read it for the first time. It took me weeks to settle down properly to another book and not instantly compare it to the power Hardy managed to wield in that ending! It is a very powerful ending. I’m afraid I’m not a fan of Hardy’s works, but I do have one very fond memory of ‘Tess’. Many years ago now, so many that it was when the current Children’s Hospital was the General Hospital, my mother was in for an extended stay. ‘Tess’ was one of the books that I took in for her and almost everyone of the medical staff who passed stopped and talked to her about it. She wasn’t that fond of the book itself but it almost made her stay in hospital bearable. I love Tess. It was the first Hardy novel I read. My GCSE English teacher had told us each to choose a novel from a list she produced and go away and read it. Another girl and I read it and then were paired up to discuss before we wrote our essays. ‘It’s the first book that’s made me cry at the end,’ she said. Me too. And I love a sad ending. There is something special about sad endings. I’ve read Tess three times now, and it’s tied with Jude as my favorite Hardy. (Yes, I like tragedy.) It’s the near misses that get to me–all those times when happiness–or at least something other than disaster–was so close but it didn’t work out. It’s like the universe is conspiring against Tess, which I think captures how desperate and impossible life could feel for a poor woman, especially at that time. Hardy is a master at putting in those heart-rending near misses isn’t he? I’m going to dig up a copy and add it to my pile. Thanks! I just finished reading this book for Classics Club and I’m checking out some of the other reviews from CC members. I really didn’t expect it to have such an effect on my emotions — as you say, enchantment, sadness, anger. I’m definitely looking forward to reading more Hardy in the future, but I don’t think I could handle the tragedy level of Tess again any time soon! I’ll have to try Under the Greenwood Tree and the others you mentioned here. Glad you loved Tess but it is an emotional roller coaster. Under the Greenwood Tree is wonderful.